FRIDAY CATBLOGGING….Our next-door neighbor and I are doing our part to stimulate the economy. Thanks to roots and trees and strong winds, our fence collapsed several weeks ago and we agreed to stimulate the local fencebuilding industry by getting it replaced. Yesterday Inkblot took his first walk along our magnificent new construction project, and as you can see by his tail propped up behind him, he approves. Who wouldn’t? 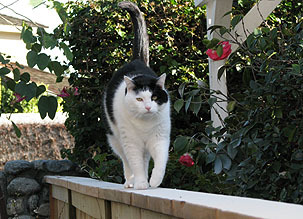 As for Domino, I hauled her up onto the fence too, but she was less impressed. She doesn’t really like being that high off the ground. So this week’s picture is as ground level as you can get. I know that I’m just begging for comments about how, um, rotund she is, but I say, bring ’em on. 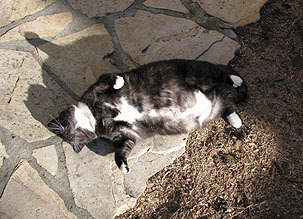 Domino is deliriously happy with her body image and thinks that it just gives her more surface area to soak up the sunshine. And she’s right. So go soak up some sun this weekend if you can. Lincoln and Washington would approve.